China is taking the next big step towards dethroning the dollar’s place as the number one reserve currency around the world. But the strategy behind this big move could send gold soaring. International oil trade is the crux of the issue. For decades, the world’s largest oil importers have paid for oil using the petrodollar, which supports the dollar’s value and fuels U.S. government deficit spending (primarily because the petrodollar is backed by Treasuries). 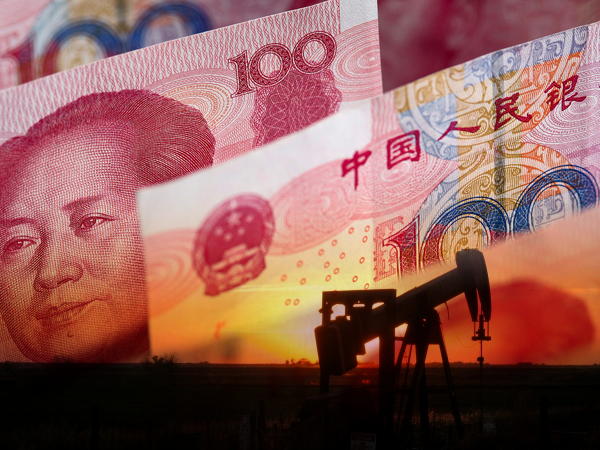 In June, China took the first step towards overturning the petrodollar by establishing a direct-trade relationship with Russia allowing for oil purchases to be made strictly in yuan. And just like that, the petroyuan was born. Not long after China’s new deal with Russia, Chinese officials began negotiations for a similar agreement with Saudi Arabia. But the discussion didn’t flow as smoothly as it did with Russia. Russia welcomed the petroyuan with open arms. But other big oil exporters haven’t been as keen to embrace it. Despite rising concerns around the U.S. dollar’s stability and viability, the yuan is still too illiquid and unestablished globally in comparison, causing many exporters to shy away from accepting it. But China has an ingenious way to solve this problem: Simply back the petroyuan with gold. By introducing these new petroyuan oil futures contracts that are convertible to gold, China is effectively negating exporters’ fears of accepting the yuan as trade payment. Gold holds a significant draw for exporters over the yuan alone, and these new contracts are opening the door for the petrodollar to be overturned… permanently. Grant Williams, an adviser to Vulpes Investment Management, a Singapore-based hedge fund sponsor, said he expects most oil producers to be happy to exchange their oil reserves for gold. “It’s a transfer of holding their assets in black liquid to yellow metal. It’s a strategic move swapping oil for gold, rather than for U.S. Treasuries, which can be printed out of thin air,” he said. Second, the U.S. government relies heavily on the geopolitical bargaining power and benefits provided by the petrodollar system. Since the petrodollar is backed by Treasuries, the federal government depends heavily on it to fund deficit spending. Without the monetary support of the petrodollar, the U.S. government could soon find itself shouldering an even bigger debt burden than it already is (not to mention lawmakers’ current budgetary struggles and the approaching need for another debt ceiling increase). While the dollar and U.S. government brace for the crushing impact of China’s new game-changing oil trade instrument, there’s one asset that could benefit handsomely from this situation, and that’s physical gold. Think of it like this: Given the choice between trading in something backed by Treasuries (which can be created at-will from nothing by the U.S. government) or physical gold, what do you think exporters will prefer? As more and more nations pile into this new gold-backed oil trade instrument, global demand for physical gold will surge, giving gold prices a tremendous upward thrust. All this is coming at a time when gold already has several bullish price drivers poised to drive it higher… China’s new gold-backed oil futures contracts are just icing on the cake.